The US economic calendar is packed with significant events this week, with the latest FOMC minutes hitting the markets on Wednesday, at 1900 GMT. Then on Thursday, a slew of Fed speakers including Chair Powell and Vice Chair Clarida will deliver remarks. Investors will look for clues as to whether a pause in rate hikes is indeed in order, amid growing fears a recession may be in sight. Fed Chairman Powell softened his tone on future rate hikes last week, indicating his central bank will be “flexible” in setting policy and is “listening closely” to market concerns. The key message was that if investors are right, and the US economy does slow severely in 2019, then policymakers won’t hesitate to pause their rate hikes, or even reverse them by cutting rates. His remarks were met with relief, helping stocks to recover while causing the dollar to fall, as investors factored in the prospect of Fed rate cuts by this time next year. 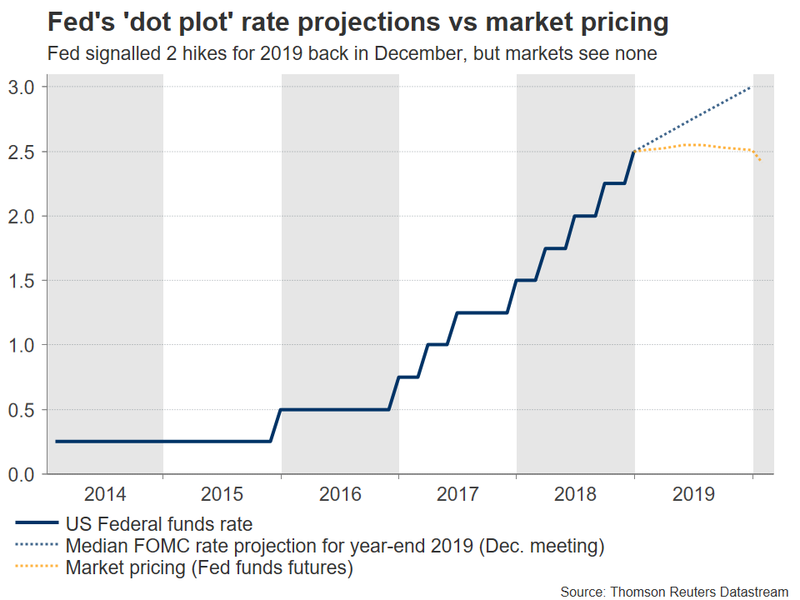 Market pricing derived from the Fed funds futures currently implies the Fed will stay on hold throughout 2019, but looking further out, it assigns a 35% chance for a 25bps rate cut by January 2020. In short, market participants seem to be pricing in a severe slowdown or even outright recession by 2020, under the rationale that the recent weakness in the US housing market and other major foreign economies will soon spill over into the broader US economy as well. And although the Fed until last week appeared adamant about continuing to hike rates, it now seems to be shifting to a more reactionary “on hold for now” approach, with future moves to be guided by incoming data. Against this backdrop, markets will await eagerly for the FOMC minutes from the December meeting on Wednesday, and will also listen carefully to speeches by several key Fed officials. Chair Powell and Vice Chair Clarida will speak on Thursday, alongside regional Fed Presidents Barkin, Bullard, Evans, and Kashkari. The burning questions on everyone’s minds are: how worried is the Fed about a looming slowdown? Are such worries shared by all officials, or are some still determined to normalize further in light of a robust labor market and strong consumer spending? Is the recent financial market volatility worrisome in itself? What would be the Fed’s first response if the data do deteriorate – pausing hikes or stopping the balance sheet unwinding? Turning to the market reaction, anything that suggests policymakers are still keen to raise rates even once more will likely be met with a spike higher in the dollar and a tumble in stocks, given that market pricing currently implies no further hikes. In such a case, initial resistance to advances in dollar/yen may be found near the 110.00 handle, with even steeper bullish moves potentially stalling near 111.40, the high of December 26. 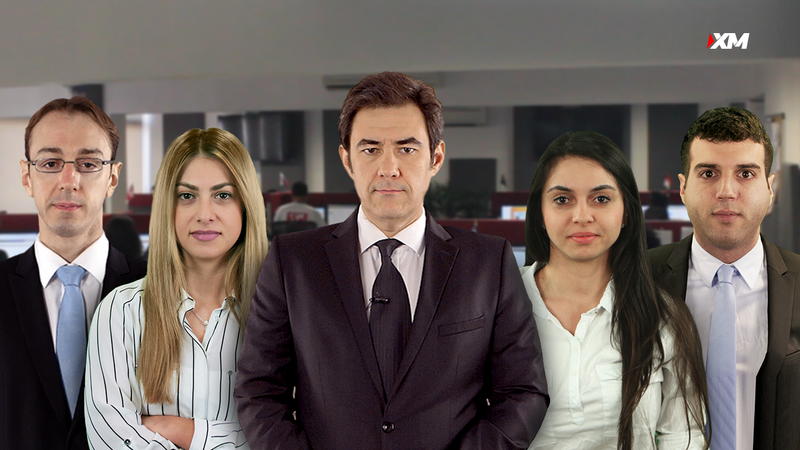 On the contrary, if officials make it clear – especially in the minutes – that Powell’s “flexible” approach reflects the entire Committee’s thinking and that the Fed will be especially cautious going forward, market pricing for future rate cuts may grow further, weighing on the greenback and boosting equities. Support to declines in dollar/yen could come around 108.00, with a downside break potentially opening the door for a test of 106.70. Finally, note that US CPI data for December will be released on Friday. While the Fed prefers the core PCE as its main inflation gauge, the agency that releases the PCE – the Bureau of Economic Analysis – is closed under the US government shutdown. Hence, until this shutdown ends, CPI are the only inflation data “in town”, rendering them all the more important.